The 2018 UEFL draft is in the books and rosters are set for Opening Day, available via the 2018 standings page on the UEFL Portal. The following statistics indicate the most commonly selected umpires. Cowboy Joe West again led crew chief picks. 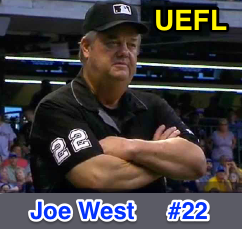 Crew Chief Draft: For the fourth season in a row, Joe West was the most drafted umpire in Crew Division, accounting for 19.7% of all crew chief selections. West led all crew chiefs with 23 CC points in 2017. In his first year as a Crew Chief, Mark Wegner was second-most selected (14.2%), ahead of Ted Barrett (13.8%, who finished in second place with 18 -cc points in 2017). No other umpire cracked the 10% mark (4th most commonly chosen crew chief Gerry Davis made up 7.9% of the cumulative roster, with Tom Hallion [5.9%], Jeff Kellogg [5.3%], and Jeff Nelson [4.6%] closely behind). All 19 available crew chiefs were selected. Primary Umpires: Vic Carapazza was the most popular selection in the primary draft, comprising 8.6% of all Primary Umpire selections. He finished in third place with 22 total points for the 2017 UEFL season. Vic Carapazza was the most popular draftee. Will Little followed Carapazza with a 6.3% primary draft rate; Little finished first with 26 points in 2017. Rounding out the top five primary selections were Angel Hernandez (4.6%), Joe West (3.9%), and Alfonso Marquez (3.6%). The umpire who finished in second place last season, Mark Wegner with 24 points, was drafted at a 3.0% clip. Secondary Umpires: In addition to leading the primary draft class for 2018, Carapazza co-led the secondary draft with John Tumpane; each umpire appeared on 4.9% of UEFL draft rosters. Little was the third-most popular selection in the secondary draft (3.9%), with newly-promoted MLB umpire Stu Scheurwater (3.3%) and Hernandez (3.0%) rounding out the top five. 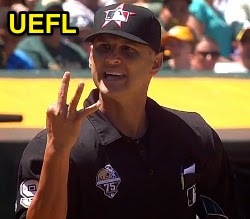 Undrafted Free Agents: MLB #44 Kerwin Danley was the only full-time big league umpire not selected in this year's draft. Call-Ups not selected include 67 Ryan Additon, 18 Ramon De Jesus, 59 Nic Lentz, 84 John Libka, 48 Nick Mahrley, 97 Ben May, 40 Roberto Ortiz, 96 Chris Segal, 62 Chad Whitson, and 75 Tom Woodring (Jeremie Rehak and Jansen Visconti were not on the draft board).